Oil and gas firms are missing out on the benefits of diversity, with participation of women in the work force lagging behind other major industries, a report says. The study – The Future of Jobs – was published to inform political and business leaders at this week’s World Economic Forum (WEF) in Davos, Switzerland. It highlights a total absence of women in chief executive roles among global oil companies and says only 11% of senior executives are female. The report also highlights a 32% “gender pay gap” in the industry despite efforts to create more opportunities for women. Gender imbalances in oil and gas and other industries were in the spotlight at a session on the future of work in Davos, where Facebook chief operating officer Sheryl Sandberg told participants “men still run the world – and I’m not sure it’s going that well”. The UK North Sea industry is to some extent bucking the trend, with a number of top oil and gas roles filled by women – and the number of female engineers growing. Deirdre Michie, Oil and Gas UK’s Aberdeen-based chief executive, said: “Women now represent nearly a quarter of the total UK oil and gas workforce – a considerably lower proportion than the national average, though comparable to other industries which focus on STEM (science, technology, engineering and mathematics) qualifications. 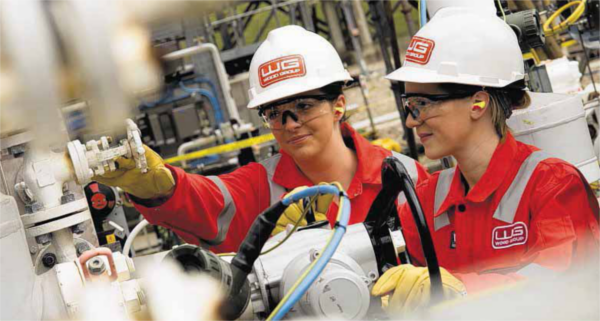 Oil and Gas UK fully supports the principle of broadening female participation in the oil and gas workforce. Even when oil was selling at above $100 a barrel, most of the industry’s top executives said they struggled to find and retain young talent. Year after year it was cited as one of the biggest problems for the sector – still one of the best-paying in the world, despite its current woes – during annual gatherings of its top brass on the side- lines of the WEF. After the collapse of oil prices to the lowest levels in over a decade, it is arguably more important than ever to widen the talent pool. But The Future of Jobs shows the industry currently has the lowest representation of women professionals among all employers in a world where, said Ms Sandberg, almost every country has less than 5% of its top companies run by women. Energy industry bosses attending WEF, including the heads of BP, Royal Dutch Shell, Eni and Total, are working on a “first declaration of intent” to close the gender gap. It will also set out principles to encourage women to join oil firms, especially in technical and managerial roles. These principles will range from making CEOs personally responsible for achieving gender diversity, to supporting women during the early years of science, technology or engineering studies. Jeanette Forbes, chief executive of Aberdeen-based energy sector IT firm PCL Group, said: “There is still a huge gender gap, with statistics backing this up year on year. I think we are seeing changes, albeit they are currently small. The largely Aberdeen-based UK oil and gas industry is hardly bereft of women in leading roles. Trade body Oil and Gas UK (OGUK) has had a woman at the helm since last May, when Deirdre Michie, previously head of Brent decommissioning communications at Shell, took over from Malcolm Webb. Oonagh Werngren is OGUK’s operations director, with responsibility for addressing operational issues in UK petroleum exploration, development, production and infrastructure. Elsewhere, Colette Cohen is senior vice-president for the UK and the Netherlands at Centrica Energy. Elizabeth Proust was recently appointed as managing director of Total Exploration and Production UK, having previously become the first woman to lead the company’s operations in Nigeria. Her successful career with Total began when she joined the company as a drilling and subsea specialist before going on to become global vice-president for development engineering. Statoil Production UK also has a woman at the top after Tove Stuhr Sjoblom recently moved to head up the firm’s office in Aberdeen, taking over from Gunnar Breivik. Ms Sjoblom previously worked as senior vice-president for sub-Saharan Africa in Statoil’s international development and production arm. And Jeanette Forbes is also living proof that women can have a successful career in the industry. Ms Forbes is chief executive of her own company, PCL Group, which she set up in March 2000 after being made redundant in an oil and gas downturn. Using the last of her redundancy money and working from her dining room table, Ms Forbes built the company up to become a global information technology service provider to the offshore, marine, commercial, industrial and renewable sectors.